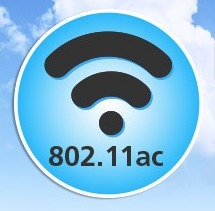 The newly adopted 802.11ac is the first Wi-Fi standard to provide gigabit performance. Using the technology concepts pioneered with 802.11n, it increases the maximum data rate from 600Mbps to 1300Mbps and eventually to 6.93Gbps. The biggest benefit to network managers may be the ability to handle a higher number of devices without unacceptable degradations in performance. 802.11ac achieves its raw speed increase by in multiple ways such as more channel bonding, denser modulation and a higher number of spatial streams. 802.11ac operates only in the less crowded 5GHz band, so stresses compatibility with existing Wi-Fi standards and can coexist with 802.11a/n devices.